The mighty Mount Khazbeg stretches to the skies. 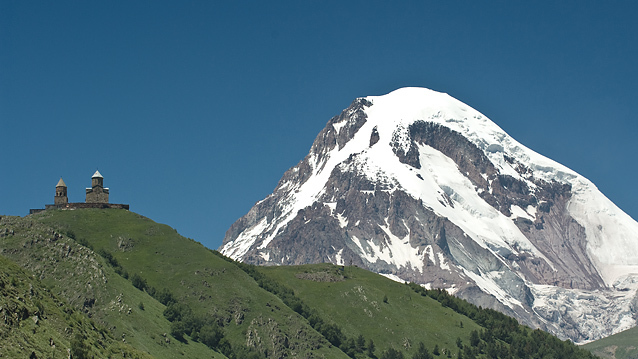 With a summit at 5047 m over sea level it is among one of the highest mountains in the Central Caucasus. 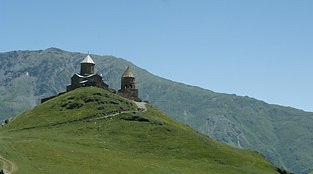 The Tsminda Sameba monastery in the village Stephansminda (to the left) is at a mere 2200 meter. Stephansminda is a crossroad to Vladikavkaz, Russia. summit of the mighty mount Khazbegi. It is 5047 meters high, and requires 3 days of climbing, included adjustment for altitude. Height sickness is a common problem although the climb is not of the most difficult ones. But for us just passing by on the roads, this is an adventure of some magnitude. Once entering Stephansminda, the snow clad summit raises high above the Tsminda Sameba Monastery, one of the most sacred churches in Georgia, situated at an elevation of 2200 meters. 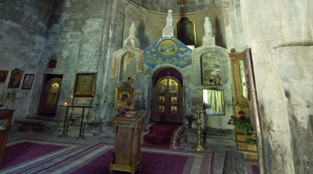 It was built in the 14th century. The church is a popular waypoint for trekkers in the area. (Reference: Wikipedia) The spectacular view from Tsminda Sameba also lures many tourists up to the church. It’s a steep walk of approximately 2 hours to get there. It is possible to rent horses, or just drive up with a Niva. The path takes a varied route through wildflower meadows, deciduous woodland and conifer belts, providing a changing tapestry of flora and fauna as you walk. This is a must for nature-lovers. Knud Hamsuns first encounter with Georgia. "Suddenly after a sharp turn, a big gap opens to the right and we see quite close to us the ice peak of Kasbeg with its glaciers sparkling white in the bright sun. It stands close to us, silent, tall and mute. A strange feeling rushes through us, the mountain stands there like it has grown out of the others, it is like a creature from another world standing there looking at us [..] It is like I am facing God”. It is just like that! A feeling of a magnitude not possible to describe. Rapid and extreme weather changes. As a tourist you should be aware of extreme weather and changing weather conditions. In just an hour the blue sky can be turned int furious thunderstorms when the humid warm winds from the Black Sea meets with the cold dry air up in the mountains. To get this kind of pictures I have in this article requires a good del of luck, and during less than an hour the clouds hid the peek completely. 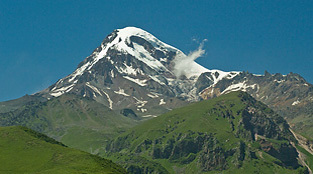 Mount Khazbegi is the third highest mountain in Georgia (after Mount Shkhara and Janga) and the seventh highest peak in the Caucasus Mountains. 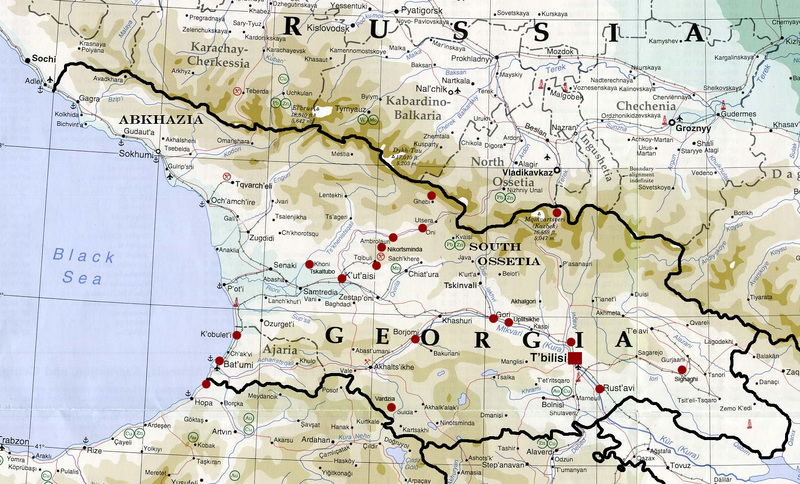 Georgians call the mountain The White Bride. 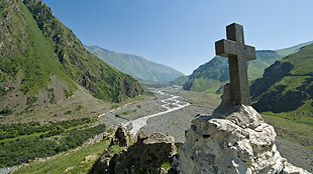 Kazbegi is located on the Khokh mountain Range which runs north of the Greater Caucasus Range. The region is highly active tectonically, with numerous small earthquakes occurring at regular intervals. An active geothermal/hot spring system also surrounds the mountain. Kazbegi represents a dormant volcano, built up of trachyte and sheathed with lava, and has the shape of a double cone, whose base lies at an altitude of 1,770m (5,800 ft). Kazbegi is the highest of the volcanic cones of the Kazbegi volcanic group which also includes Mount Khabarjina (3142 meters). The best-known glacier is the Dyevdorak, which creeps down the north-eastern slope into a gorge of the same name, reaching a level of 2,295m (7,530 ft). At its eastern foot runs the Georgian Military Road through the pass of Darial 2,378m (7805 ft). Up at Tsminda Sameba monasteri at 2200 m.
View to the mountain from the monastery. Panorama over Stephansminda from the monastery. Close to the Russian border on the way to Vladikavkaz.